Not only can Grievous not beat full meta teams, he apparently can lose to just random characters thrown together. All of this happened before I could get a turn. B1 went from 100 stacks to 28 before he could even take a turn. That is not a random team, those are 5 of best early game characters you can get with "little effort." That being said why are end game characters that are much harder to get and gear being beat by characters you yourself said are early game characters you can get with "little effort"? The only end game character there is Wampa. By building Phoenix you will easily get both Thrawn and Palpatine. Daka is in the cantina store, and Vader is much easier to get than Grievous. Those five also have not been touched in over a year, yet are able to beat a newly reworked team. I get that they are all good characters, but have very little synergy compared to a full Grievous team and still steamrolls him. How are separatist droids "harder to get" end-game characters? You can start farming GG once you hit level 60 from fleet shipments. B2 and IG100 are low energy cantina nodes and we know the other two aren't legendaries. Compare that to the team above which requires Phoenix (EP, Thrawn). a similar farm to GG (Vader), 89,000 GET (Wampa), and a hard node farm. Edit: Sorry, did not see that this was not addressed to me. If all of those toons moved before you as you claim, then it’s a mod/speed issue. Yet, here you are blaming it on the rework. If it is not a mod/speed issue, then you would have clearly provided all of that data for us to see first hand. Conveniently nowhere to be seen though. If you’re going to complain about something, do it properly. Instead of as a dire attempt to be heard by the devs simply by adding to the fire. ‘If we all scream loud enough - just maybe they’ll rework it again!’. They all had +50% tenacity from B1 yet all but B1 got stunned by Palps, then thrawn fractured B1, the fastest character on my team, and the multi-hit from fracture took out 24 stacks on its own. Which end game characters are you referring to? The only nee ones are B1 and droideka. And from the looks of it he is using them at low star, so that means everyone there is free and anyone at the appropriate level can make either team. You may be using the wrong team. Swap 88 with bb8. I heard something about that being effective. Will try it tomorrow when my arena refreshes. I have him g12+. Will let you know tomorrow. Using BB8 instead of 88 achieved much better results. 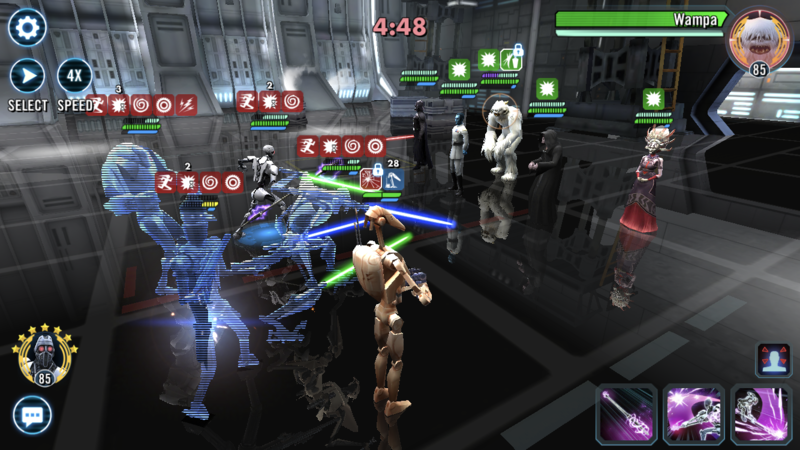 Grievous lets the droid start a TM train where they all get more TM for damaging target locked enemies, and against DS enemies they even get TM removed on hit. So the droids just spam AOEs which gets BB8’s illuminated destiny up insanely fast. And BB8 gives the droid team the first turn to get it all started. That why thrawn's op, he fits everywhere. That sounda fantastic, thanks. Im happy for you.